Chef Stephanie Izard opened Duck Duck Goat, a Chinese restaurant in the West Loop. Dishes like crispy frog legs & potato, slap noodles, xiao long bao and goat belly lo mein are inspired by Izard's travels throughout Beijing, Chengdu, Shanghai, Hangzhou and Taiwan. Nate Meads oversees the restaurant’s pastry program with a Taiwanese-focused dessert menu. Duck Duck Goat, 857 W. Fulton Market, Chicago, IL 60607, 312-902-3825. Chicago’s first mezcaleria, Mezcaleria Las Flores, opened in Logan Square. The agave-focused bar is helmed by former Rick Bayless chief mixologist Jay Schroeder. It’s located next door to Johnny’s Grill, where mezcaleria guests can order menu items. Schroeder also plans on hosting agave spirits seminars and tastings in the coming months. Mezcaleria Las Flores, 3149 W. Logan Blvd., Chicago, IL 60647, 773-278-2215. In May 2016, the team behind Peruvian restaurant Tanta will open a 70-seat globally-influenced craft cocktail lounge, Arbella, just down the street. Arbella, 112 W. Grand Ave., Chicago, IL 60654, No phone. Chef Noah Sandoval (Senza) opened Oriole in the West Loop, with his wife Cara and pastry chef Genie Kwon. The 28-seat restaurant serves a 15-course tasting menu, including dishes like Alaskan king crab with ras el hanout, beets and radishes; and Red Hawk with pretzel lavash, pear and Sauternes. Drink pairings include a mixed selection of cocktails, wine, beer and non-alcoholic beverages. Oriole, 661 W. Walnut St., Chicago, IL 60521, 312-877-5339. Lettuce Entertain You has opened il Porcellino in the former Paris Club space. The rustic Italian menu focuses on house-made pastas, vegetable antipasti, focaccia pizzas and the signature dish, il Porcellino, with heritage Berkshire pork and wild Umbrian cicerchia beans. il Porcellino, 59 W. Hubbard St., Chicago, IL 60654, 312-595-0800. Sepia owner Emmanuel Nony and chef Andrew Zimmerman are planning to open a new restaurant in 2016. The name has not yet been announced. Sepia, 123 N. Jefferson St., Chicago, IL 60661, 312-441-1920. Tavern on Rush’s patio café is open for the season. Both Rush and Bellevue streets offer covered seating with awnings and heaters. There are also four flat-screen televisions for watching games and other televised events. 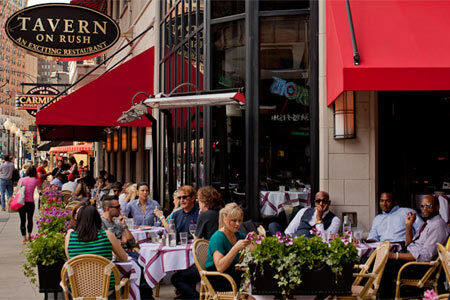 Tavern on Rush, 1031 N. Rush St., Chicago, IL 60611, 312-664-9600. Chef Stephen Wambach joins B. Hospitality Co. as the executive chef and partner at Formento's. His new menu will feature lighter, brighter flavors of Southern Italy. Most recently, Wambach was the executive chef of the Four Seasons Hotel Chicago. Formento's, 925 W. Randolph St., Chicago, IL 60607, 312-690-7295. Chef de cuisine Kevin McCullen has left the kitchen at Band of Bohemia, the “culinary brewhouse” fromCraig Sindelar (Alinea) and Michael Carroll in the Ravenswood corridor. Band of Bohemia, 4710 N. Ravenswood Ave., Chicago, IL 60640, 773-271-4710. Tête Charcuterie, a spot from Thomas Rice and Kurt Guzowski, has closed after two years in business. Tête Charcuterie, 1114 W. Randolph St., Chicago, IL 60607, no phone.